Pacific Rim smartly makes its “doubles” and “twinning” Gemini themes, ruled by Mercury, a core part of the movie. The plot involves paired Jaeger pilots, two minds communicating in The Drift, neural handshakes, fathers and sons, brother and brother, and dual combats involving our hero robots and those nasty Kaiju – evolved, alien, under-water monsters that would like our earth for themselves. It also involves hair. Color blocked hair. That’s Mako Mori’s hair we’re talking about – jet black with stunning cobalt-colored tips that frame her face like a long spit curl. 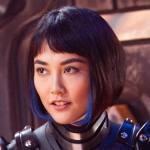 Mako, portrayed by Rinko Kikuchi, is not only a newbie Jaeger operator paired with Raleigh (Charlie Hunnam ). She’s also strongly linked with a father figure, Stacker Pentecost (Idris Elba). But the real Gemini partnerings here are the two-toned tresses. So what’s the dual, Gemini message communicated in her locks? At the most basic level, blacks-and-blues are the bruises you’d expect to be dealt when the future of world civilization is at stake. It’s also the color of the ocean, which generates the Kaiju. But at a more ethereal and spiritual level, blue is the color of cool thinking and grace under pressure. And Mako, whose metal suit always seems to radiate a bluish, holy glow, has to figure out a way to keep her personal revenge motives against the Kaiju from getting in the way of her humanitarian mission, which could take her life. Looking good at work? In Pacific Rim, the hair is part of the dress code.